The suburb of Greenwood Village is an affluent community situated on 8.1 square miles that is known for its style of high-end tastes, wealth and upscale lifestyle. The community is situated in the Denver-Aurora Metropolitan Statistical Area in Arapahoe County. The city has Home Rule Municipality as its form of government. Homebuyers in Greenwood Village who are searching for high end properties will find plenty of examples with open floor plans. Elegant dining areas and beautiful terraces overlooking the mountain vistas, add to the ambience of the properties. The majority of residents in the city owns their homes (76.6%) while 23.4% are renters. The city has a total population of 13,925 residents who have enjoyed the various amenities at Fiddler's Green Amphitheatre. These venues showcase a wide range of talent in the largest outdoor amphitheater in Denver metro area. There's lots of galleries, fine dining and shopping in the Greenwood Village Downtown District. Costs for houses in Greenwood Village have risen an average of 3.3% over the prior 12 months. 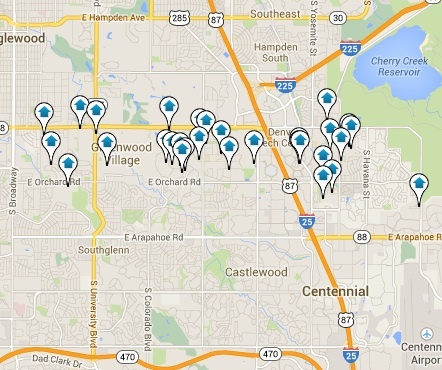 The median list cost per square foot in Greenwood Village is $303. The average home was built in 1988 and the median home size is 2,680. Homebuyers can choose from a wide range of styles, designs and floor plans. The city has managed a constant, but moderate improvement policy over the years. Greenwood Village exudes an aura of prestige and distinctive character which places residents of the city among the upper echelons of society.